We often receive messages from customers telling us that they’re struggling to find a set of bridge pins that fit their acoustic guitar properly, or that their bridge pins keep popping out. 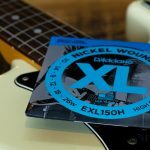 Whilst many guitars are quite happy to be fitted with standard sized bridge pins, a smaller number of guitars may require bridge pins that are sized and shaped differently. However, that being said, one of the most common reasons players experience frustration with their bridge pins is because they haven’t been fitted correctly. So what exactly is a bridge pin’s purpose? A bridge pin acts a little bit like a doorstop and holds the string in position so that when we start to wind it around the machine heads (or tuners..tomatoe, tomato), the ball end stays put and allows us to bring the string up to pitch without it flinging out. Bridge pins play a very similar role to that of a tailpiece or bridge on an electric guitar which stops the string being pulled all the way through. Well yes, essentially this is what the process involves, however, there are a few things to be mindful of to ensure the pin doesn’t pop out whenever it wants, and let’s face it, it’s always at the most inconvenient moment. So where does the string and pin need to be? Before the pin is fully pushed down and has secured the ball end of our string in position, we need to ensure the ball end is brought up as high as it can go without reappearing from the hole. The ball end should be directly underneath the top of the guitar and butted snugly up against the bridge plate. Once it’s there, we can then push the pin down and secure the string in place. If you can get this first part of the restring process done correctly, you’re on to a winner and it will make life a lot easier when it comes to winding the strings on and tuning up. If you take a look at the image below, you’ll be able to see exactly what you’re aiming for. What happens if the string isn’t sat directly underneath the bridge plate? 1. The pin may have been pushed down prematurely. Before the string is “secured” in position there may have been a little more string still yet to be pulled up. As a result, when the string is tightened up by the machineheads, the increasing tension will keep pulling this “excess” string up until the ball end eventually sits underneath the bridge plate. As this happen, the ball end will inevitably pop up. 2. Another place the ball end of the string usually ends up is caught directly underneath the bottom of the bridge pin. (See image below) The issue with the ball end residing in this position is again, once we begin to wind the string around the tuner, any increasing tension in the string will cause the ball end to act as a lever and push the pin up and out. So how do we ensure the ball end is where it needs to be? We need to feed the string down the hole first, place our bridge pin in (gently!…don’t push it all the way down yet) then slowly pull the string back up until the ball end hits the underside of the guitar. Once this happens, that’s our cue to pounce and push the pin in place. As a result, getting this part right definitely becomes a bit of a “feel” thing. It’s a push and pull technique. With one hand you need to be pulling the string up (almost like you’re pulling it back out of its hole), whilst the other hand manoeuvres the pin (give it a little wiggle*) allowing the ball end to come up and then when the time comes, you push it down. *The small wiggle helps to dislodge the ball end if it gets caught under the bridge pin. One final check to ensure the ball end is where it needs to be is to reach inside of the soundhole of the guitar and literally “feel” where the ball end is. Often, if you discover it isn’t completely pulled up, you can lift the pin up slightly and push the ball end of the string into the bridge plate using your finger tip and then press the pin down once it’s there. Do the bridge pins need to all sit in line once they’re down? There’s often a misconception by some players to believe that once the bridge pins are fitted, they need to be pushed all the way down as far as they can go and in doing so, all the pins need to sit nicely in line with each other. In reality, some bridge pins may sit a little higher than others and it’s not something to be concerned about. So long as the bridge pins are doing their job and holding the string in position, all is ok.
What if my bridge pins still don’t fit properly in my guitar? Another concern we often hear from customers is that their pins are too loose. When your guitar has no strings fitted and your pins are loose when placed in the bridge, fear not! This is quite normal; once the string is fed down the hole and the pin is fitted in, the friction between the string and pin takes over and helps hold everything in place. 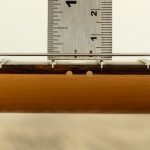 The hole sizes in acoustic bridges certainly aren’t consistent across all guitar manufacturers. Likewise, there isn’t one specific size to which bridge pins are made. As a result, most pins will vary in their thickness from one brand to another, however, the differences in sizing is fairly small and usually only by a 0.10 – 0.20mm. If you’re still struggling to get your bridge pins to fit in the guitar, you may find your guitar simply requires slightly larger (or in some cases, smaller) bridge pins. If you do need a specific size, all of the bridge pins available on our website have been listed along with their sizing (measured at the top of the shaft directly underneath the collar). You can also filter these out down the left hand side of the page if you have a specific sizing in mind. You can view our range of bridge pins by clicking here. 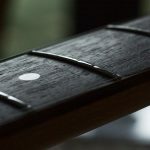 On older guitars or guitars that have their bridge plates made from softer woods, you can often see their holes have been worn down where the string starts to wear the plate away over time. As a result, this can make the holes slighter larger than normal and “standard” sized bridge pins can often be loose in these holes. If you do find your current set of pins feel a little too small, one “hack” that you may find useful is to turn your pins around so that the groove of the pin is facing away from the headstock of the guitar. Typically, you would usually fit the pin with the groove facing the headstock which creates a bit of extra room for the string to fit more easily down the hole. However, by turning the pin around, the gap is made smaller creating a “snugger” fit for the string. If this doesn’t work and the gap is still too large and you’ve tried larger sized pins, a last resort may be to fill the holes and have them resized. Likewise, if the holes are too small, the holes may need to be made larger. If the thought of taking a drill to your guitar makes you a little queezy, we’d always recommend taking it to a luthier to have the work carried out by a qualified professional. It’s not necessarily a job you want to pull out your dusty old Black & Decker drill for if you’re not experienced with this sort of thing. 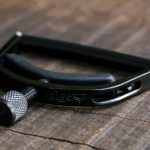 We hope that this blog has helped give some insight into bridge pins and how they should be fitted. If you require any further information please do not hesitate to leave a comment in the comments section below or drop us an e-mail and we’ll be more than happy to offer any advice where we can. No need to fill the holes in your bridge and have them resized. A turn of insulation tape around the taper works fine. Even as an old rocker I’m still happy to learn new tricks. Thank you for sharing some ” silent knowledge “. Mr Dave Doll at Martin Guitars has some good tips about restringing your guitar on the You Tube. Hi Bob, yes the Martin YouTube channel is pretty useful and some good vids with Dave Doll too. Making a bend by the ball end before inserting the string helps keep it away from the end of the pin when inserting that. Pulling up on the string then seats the ball end correctly. 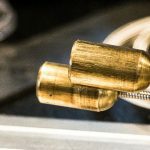 A common reason for pins “popping” when tuning up is that the pin slot is to shallow or too narrow to accommodate the thick overwound part of the string at that end. If the pin is hard to inset, that may well be indicative of this. A minutes work with a small file to widen/deepen the groove will fix it. With the strings not tensioned, pins should be easily removable with finger and thumb. If they are tighter than that then you need to sort it or you’ll need to resort to those awful string puller tools etc. The pins don’t need to be tight -they aren’t there to “wedge” the string in place. In fact, once tensioned, the string holds the pin in place. Thanks for the comment Keith and additional tips. Yes we sometimes like to put a small bend in the string before placing it down into the bridge. Like you say, it just directs the string away from the underside of the pin reducing the likelihood of it getting caught. Really useful. Thanks. Super service and useful tips too!